← The day my mom lost her skirt in church. Scott and I just blew our wad of points in Maui. And boy, was it fun. In the next few blog posts, I will attempt to share the highlights of our trip. I struggled to make plans ahead of time. There are a lot of books out there on Maui (and of all of Hawaii). I hate tour buses and canned vacations, and found it hard to discern what was what in the books. So, we planned a few things, but primarily followed our noses. 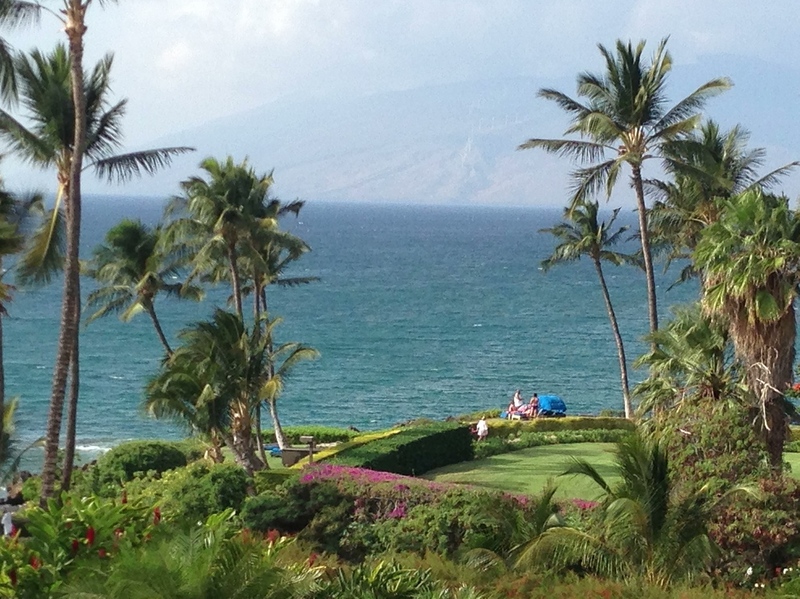 First, we stayed at Wailea Beach Marriott Resort–Scott had Marriott points. It turns out that this Marriott property is where lots of people go blow there points. It was FULL of elite rewards point blowers. The resort was lovely. It is clean, expansive, understated but elegant, and picturesque. One of the first things we noticed about Maui in general is that where the land is not watered, it looks like a volcanic version of the Texas Hill Country. It is brown, barren, and full of dry brush. Pretty, but rustic. But as our cab driver drove us into Wailea, we noticed more and more green. And as we drove into the resort, it looked lush and colorful. The difference was striking. The lobby of the resort is outdoor, with waterfalls flowing, and birds chirping. Tropical juice and pineapple was available and the points users actually camp out and fill their cups over and over. And we realized why. It is about the only thing that is free in the resort. No free parking. No free coffee. No free anything. Because nothing has to be free because people come anyway. And they come because this is the image that greets them upon arrival. When we arrived, we got our first Mai Tais and walked around the resort and along the boardwalk to see the other resorts neighboring ours. Beautiful. About the time when our Mai Tais glasses were empty, our room was ready. After settling in, we walked up the hill to Pita Paradise. I was not impressed with the name, but it came highly recommended. The owner fishes most days and sells what he catches. I had an ahi tuna kabob and Scott had mahi mahi and ahi tuna. Both came with fresh veggies and really good pita bread. 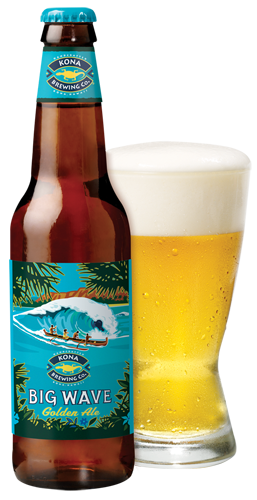 We shared a beer that we really enjoyed, Big Wave Golden Ale, by Kona Brewing Co.
We tried really hard to stay up until about 8 and I think we almost made it. The next day started early, because of the time change. We got coffee from the Starbucks at the resort and vowed not to do it again. We walked toward Kehei along the beach for a mile or two. We were amazed that so many were out and about early. But because the winds kick up in the afternoon, the morning is the best time to be at the beach. We had to return to the airport to pick up our rent car. Rather than spend another chunk of cash to hire a taxi, we took the city bus. And it was great! It was a great way to see #1 real Hawaiians, and #2 real life in Maui. We picked up our car (convertible) and went directly to Mama’s Fish House in Paia (east of the airport). This is a restaurant with a view of the north shore of Maui with big waves. Here’s the view from the dining room. Mama’s is a splurge, but worth it. It gives you the classic Hawaiian experience with incredible food. We had Tahitian ceviche, some form of grilled octopus, stuffed mahi mahi with a macadamia nut crust, grilled corn and asparagus. Yum. We spent some time in Paia afterwards. I would describe it as a Hawaiian Fredricksburg, Texas. Lots of tourist stores with a few really nice shops. Worth walking around. We then headed to Whole Foods to stock up on coffee, breakfast supplies and some picnic food. We sat by the pool for dinner, watching the sunset, with our picnic supplies and our books. It was a good day. Paia was by far my favorite little outing we took in Maui. And Mamas…dang. I dream about the lobster guacamole we ate there all the time. Sigh.